One of the most popular and evocative images of Shiva in South India in particular is that of Shiva Nataraja, the King or the Lord of the dance. Another significant example of the duality of existence. The great ascetic, a beggar asking for alms, naked body sprinkled with the ashes of the crematory, becomes lord of a frantic dance in a circle of flames of Agni, prabhamandala or alatacakra said, dances the Tandava, symbolizing the entire evolution of the universe. 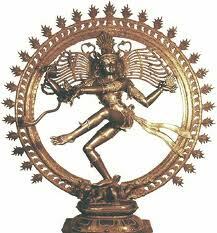 But let see in detail the symbolism of this powerful image that represents one of the 108 positions of the Tandava. The right foot is placed over the demon Apasmara Purusha (or Mujalaka). Apasmara means forgetfulness, oblivion and symbolizes ignorance, false belief understood as maya, an illusion to believe that real what is transient and, therefore, that binds to the human passions materials and condemns him to be reborn in the cycle called samsara . The left leg is raised and bent to the right to express the liberating function of the god of dance. Shiva holds damaru, the drum composed of two united triangles, symbols of the lingam and the yoni, male and female aspect. It’s the drum from which primordial sound was born, the sacred syllable AUM. That is the symbol of creation. The upper left hand of Shiva is in ardhachandra mudra, the half-moon pose, and holds a tongue of flame, symbol of god Agni, symbol of distruction. The lower right hand is in abhay amudra, the gesture that represents the negation of fear, the gesture that gives confidence, the protective posture. The second left arm is in gajahasta mudra, the gesture of trunk of elephant and points at the left leg, the emancipation way. Behind the head long hair of the god are stretching, moved by the violence of the movements of the dance. Of course, there are other symbols of Shiva we've seen in a previous post: half-moon, the Ganges, the necklace of skulls. The static god represented by the lingam becomes the relentless engine of the universe, the eternal energy that creates, maintains and destroys everything, the global and unremitting dynamism theorized by Hinduism where nothing is static, permanent, but everything is in a rapidly emerging with the exception of the one reality, never born and never dies, indefinable and ineffable, one who isn’t being neither not-being, beginning of all things: the Brahman.